Hello and welcome to my Fender MA 1 review. I’ll also provide video of the MA-1 in action so that you can hear for yourself the tone of the instrument and some user reviews so you can read about other people’s opinions on the MA-1. First off, this guitar is a 3/4 size guitar so it’s much smaller than your average guitar. So naturally it will produce a quieter, less full sounding tone. And so it did. But that sound was far from unpleasant – especially given the seriously low price-tag. Sure if you’re looking for a full sounding boomy dreadnought type guitar then this won’t be for you. But it wasn’t a bad sounding guitar by any means. To my ear it sounded almost part ukulele! Which isn’t a bad thing if you don’t mind that smaller quieter sound or if you’re looking for a beginner guitar for a kid. I was pleasantly surprised with how this guitar felt when I picked it up. It felt like a pretty good quality guitar to be honest – more so than a lot of higher priced guitars. 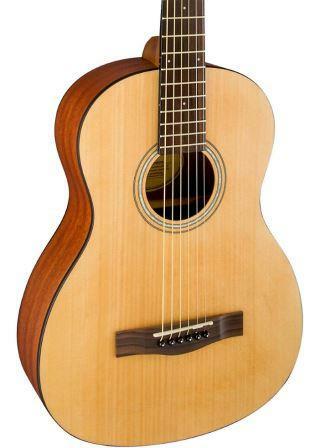 It is all laminate top, back and sides – but at this price range you wouldn’t expect a solid top or back and sides and this is a big reason why you can get this guitar so cheap. Never as good as solid wood but does the job for a much cheaper price. I was impressed that they didn’t revert to cheap plastic for the nut and saddle. The MA-1 Is not an electric-acoustic. It doesn’t come with electronics. Check out the video below to learn more about the MA-1 and to get a better idea of how it sounds. It felt like a parlor guitar to play – which are fun to play sometimes – so you could call it a ¾ size or you could treat it as a parlor guitar. Do to its smaller scale length it was difficult to fit my fingers in the higher frets but this wouldn’t be a problem for smaller fingers – and also I could still do it, it was just more difficult than on a normal scale length. If I bought it I would have the action lowered. It was too high for my tastes but otherwise this was an easy guitar to play. It has a pretty standard nut width of 1.69” (43mm). This is a nice width that makes it easy for playing barre chords, flat picking and strumming but you can still play finger style on it. The fingerboard is made from rosewood – this is a quality fingerboard material so no complaints there. The scale length is 23.3″ (592 mm) which is considerably shorter than a full size guitar’s scale length. As mentioned above this can make it more difficult to fit bigger fingers into the upper frets but also has its advantages. A shorter scale length means there is less tension on the strings and this can make it easier, both physically and technically, to play the guitar – great for beginners. This would definitely be great for a kid starting out on a guitar or a smaller adult starting out on guitar. It would also be a great guitar to have as a travel guitar. It’s not very expensive so you wouldn’t be as precious about putting it in the back of your car – or playing it around the camp fire. And it’s also nice and small so takes up less room. 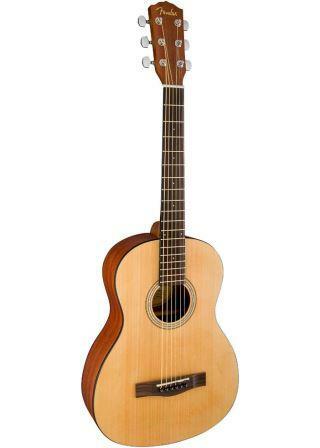 You can also get the classical version of this guitar (the MC-1) but I didn’t get a chance to play that one. This guitar generally goes for around $140 – that’s super cheap for a guitar that’s not just a toy guitar. So you definitely get your money’s worth in my opinion. Don’t expect it to be a full sounding, awesome instrument – but for the price it’s a great choice if it’s suited to you. If you’re interested in the MA-1 check out the links below for more info and for current prices. If you’re keen to check out some other guitars in the under 300 price category, check out the link below.